I’m on a muffin kick the past couple weeks. First pumpkin, now apple. Both are vegan, but you’d never know it because they sure don’t taste like health food. I love it when I don’t have to compromise on taste or texture, even without using eggs or butter, and can create a healthier-than-the-alternatives recipe. 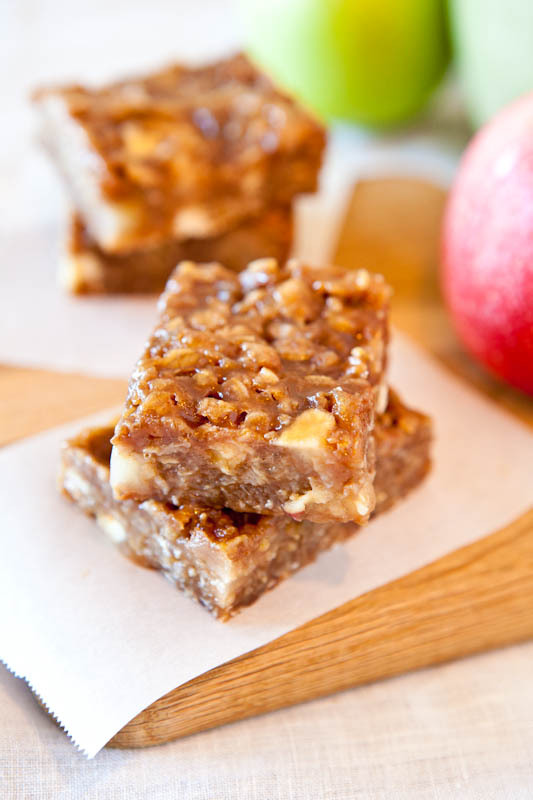 They’re full of chunky apple pieces, and are spiced with cinnamon and a bit of nutmeg, giving them a nice pop. I’m a cinnamon fan, and used 3 teaspoons. It’s not over-powering and I think apples can really stand up to spices. In fact, I’d probably use more next time. 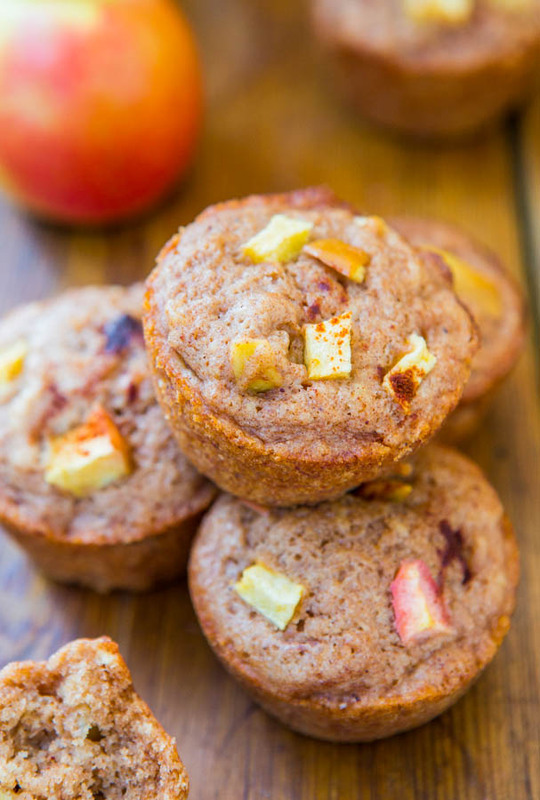 The muffins are fast and easy to make, you don’t need a mixer, and ready in under a half hour. To replace the egg, I used one large banana. 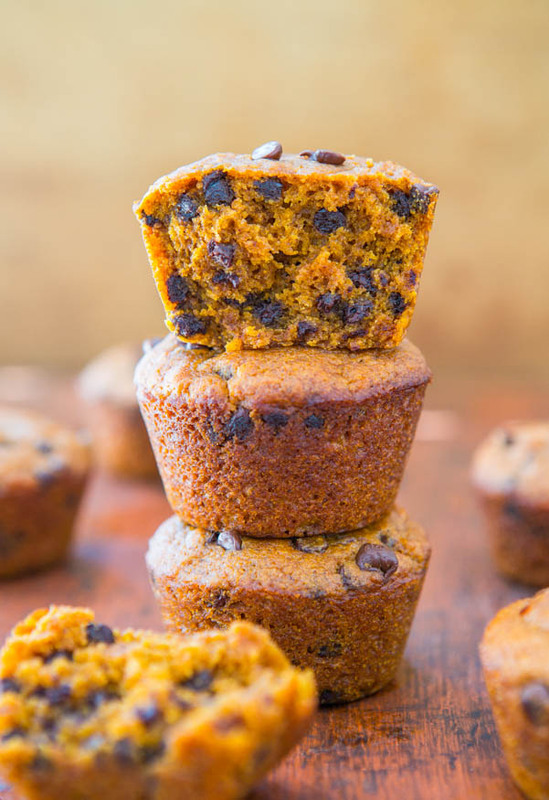 Bananas, pumpkin, and avocado are workhorses in vegan baking for the moisture, richness, and softness they help create. The banana flavor isn’t noticeable, and it’s present for its texture and to fluff the batter like an egg would. Applesauce could likely be substituted, although I haven’t tested it. 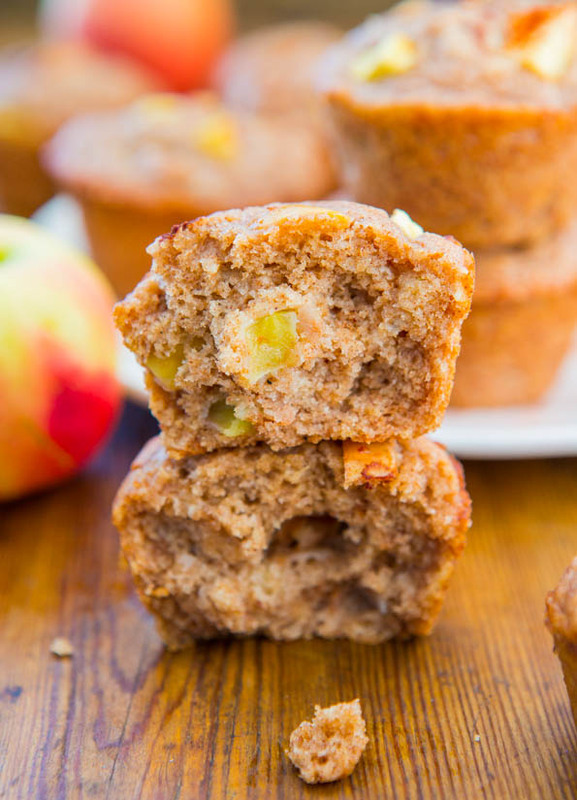 I suspect the muffins won’t be as soft and tender with applesauce as with a banana. Rather than using melted butter, I used Coconut Oil from iHerb.com. Code AVE630 at checkout saves you $10 off your order. iHerb is my online shopping source of choice for everything from probiotics to face cleanser to stevia. The muffins don’t taste like coconut, and even if you don’t like coconut, I suggest using coconut oil anyway. It adds a flavor undertone you can’t put your finger on, and lends a subtle richness that’s so comforting. Sub with canola or vegetable oil if you must. 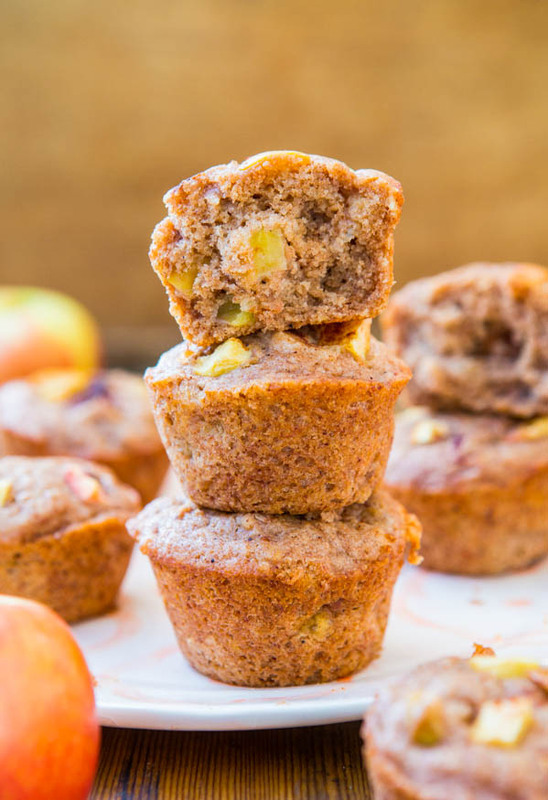 After scooping the batter in my muffin pan, I topped each muffin with a few reserved apple chunks because I wanted the visual appeal of seeing hearty apple pieces crowning the soft muffins. 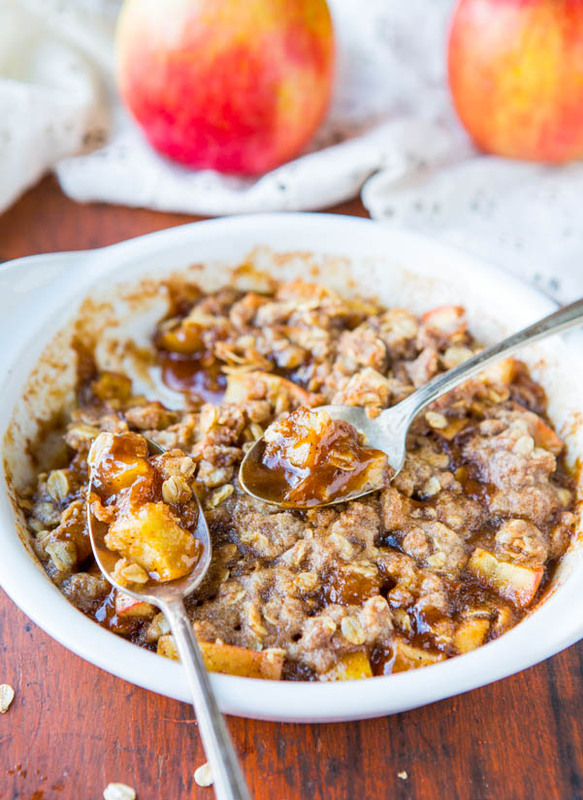 The apples soften while baking, and take on a chewier texture, but still have some snap and faint crunch. 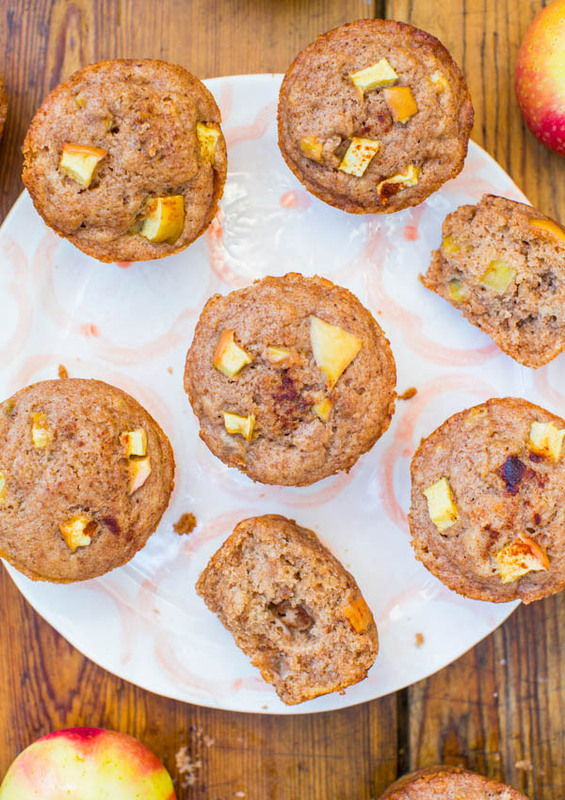 Their juices release, and it helps the muffins stay soft and moist. 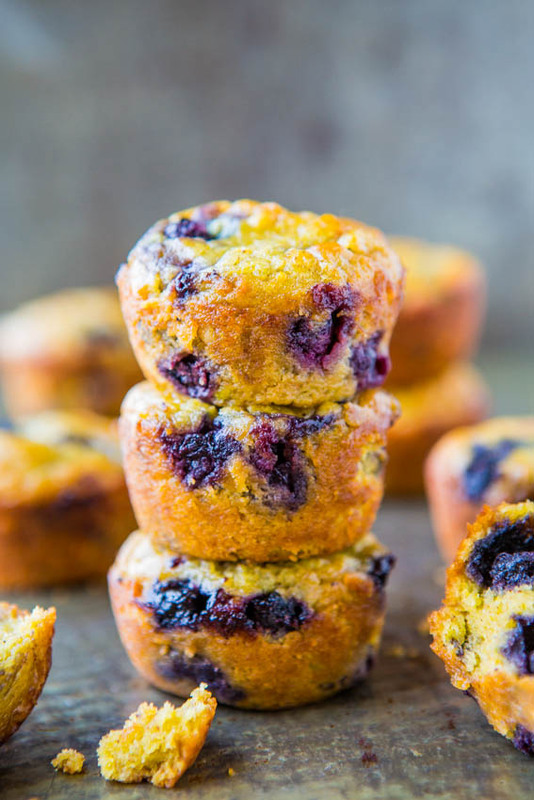 The muffins are springy, bouncy, soft and fluffy, with the right amount of density. Light enough, but not airy. The smell while they bake is heavenly, from the cinnamon, nutmeg, apple, banana, and coconut oil. Your house will smell like a fall-scented candle, minus the candle. I suspect the recipe would work as mini-loaves, adding about 5 minutes to the baking time. It likely would work as one large 9×5 loaf, and would probably take 45 to 60 minutes at a reduced oven temp of 350F, but I haven’t tried. I love muffin tops, I mean, who doesn’t relish picking off those perfectly domed, prized-possessions? 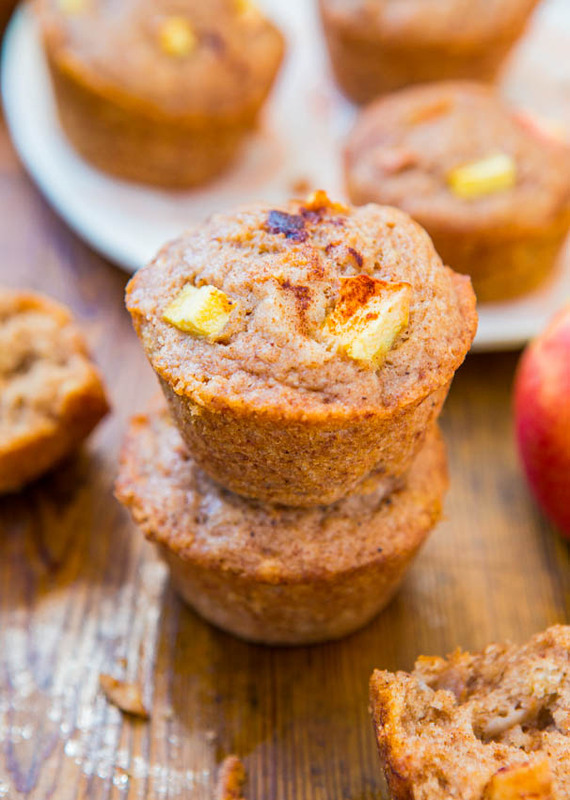 Going to town on muffin tops with baked-in apples is a page straight out of muffin top heaven. If you’ve ever forgotten to pick up eggs or ran out of butter, don’t worry. 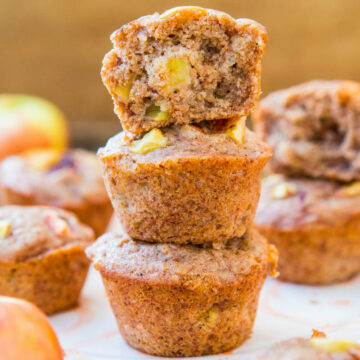 The soft, fluffy, tender muffins are full of chunky apple pieces, that soften and turn slightly chewy while baking. 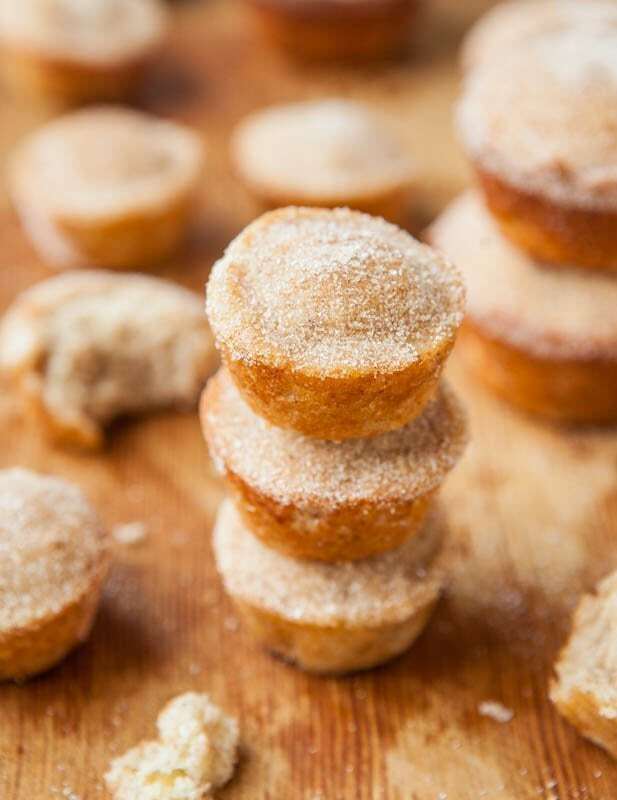 The muffins are well-spiced with cinnamon and a bit of nutmeg, giving them a nice pop of comforting flavors. 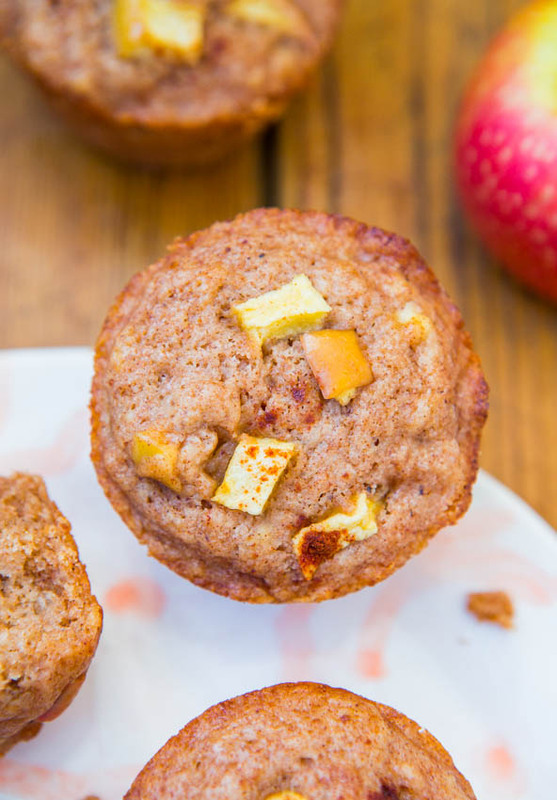 You’d never guess these muffins are vegan or on the healthier side, and you won’t miss the eggs or butter one bit in this fast, easy, no-mixer recipe. I used coconut oil and it doesn’t make the muffins taste like coconut, but substitute if desired with another oil. I suspect applesauce may be used instead of banana, but I have not tested it. 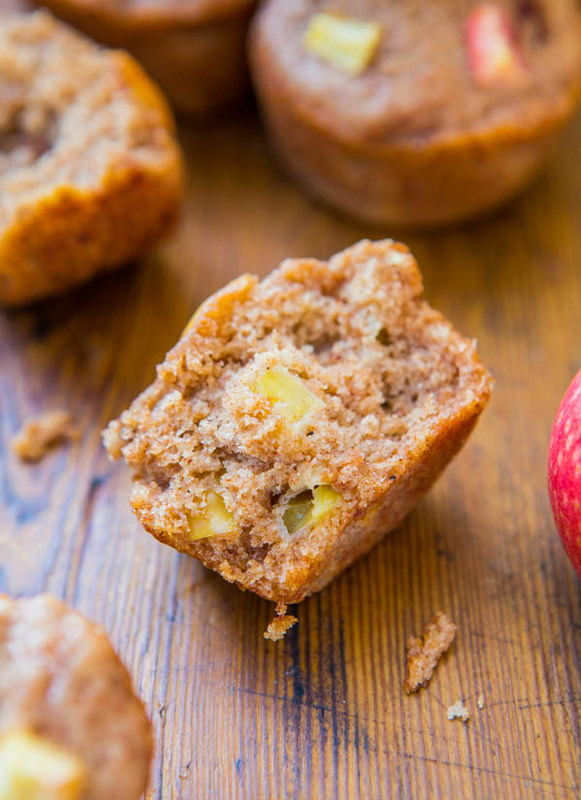 The muffins are great for breakfast, snacks, and freeze well. For the Apples – In a medium bowl, combine 1 1/2 cups apples, 1 teaspoon cinnamon, 2 tablespoons all-purpose flour, and toss to coat. The flour helps prevent apples from sinking during baking; set aside. Batter – In a large bowl, mash the bananas with a fork. Add the sugar, milk (room temp milk will prevent coconut oil from re-solidifying; if it does anyway, some small clumps are okay), oil, vanilla, 2 teaspoons cinnamon, nutmeg, and whisk until combined. Add 1 cup flour, baking powder, optional salt, and stir until just combined; don’t overmix. Batter is quite thick and if yours is seemingly too thick, add a tiny additional splash milk to thin it. Fold in 1 1/2 cups apples and any loose flour in bottom of bowl. Divide batter equally among the cavities of the prepared pan. Each cavity will be about 3/4 full. Spraying a one-quarter cup measure with cooking spray so the batter slides right off is handy here. 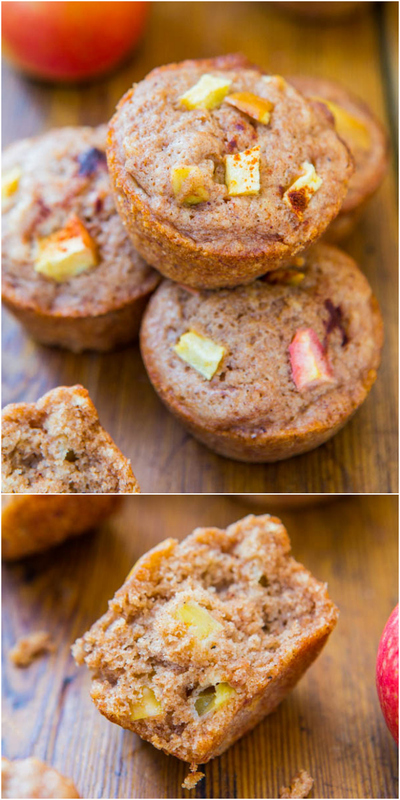 Using the reserved 1/4 cup diced apples, top each muffin with a couple pieces, divided equally. 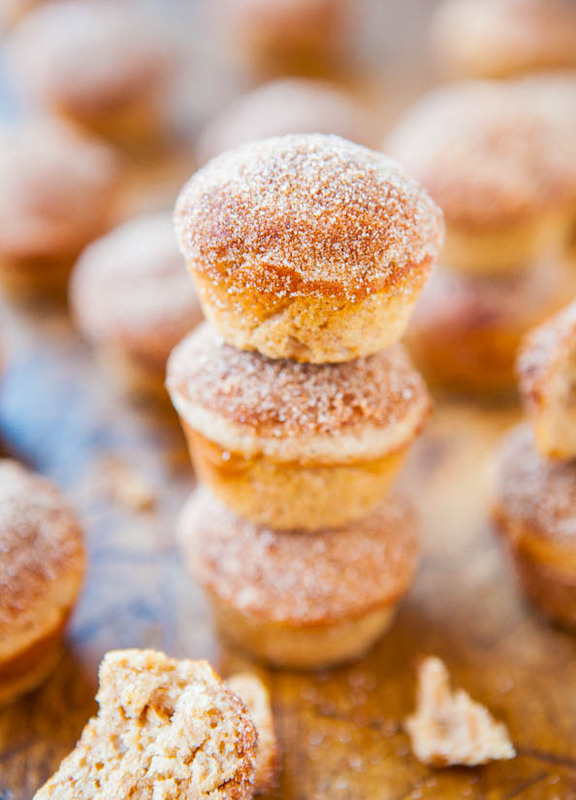 Optionally add a pinch of turbinado sugar and pinch of cinnamon to each muffin top. Bake for about 17 to 18 minutes, or until tops are domed, puffed, and a toothpick inserted in the center comes out clean, or with a few moist crumbs dangling but no batter. Allow muffins to cool in pan for about 10 to 15 minutes before removing and placing on a rack to cool completely. Muffins will keep airtight at room temperature for up to 5 days, or in the freezer for up to 6 months. 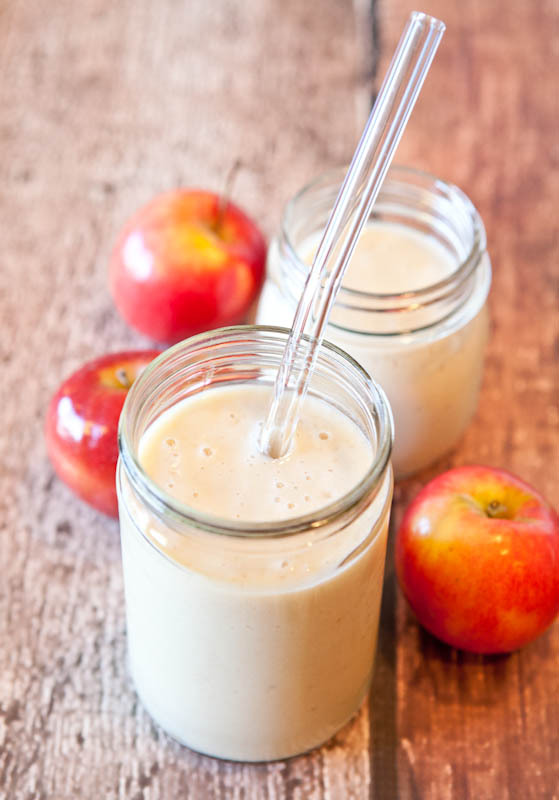 What have you been making with apples this fall? 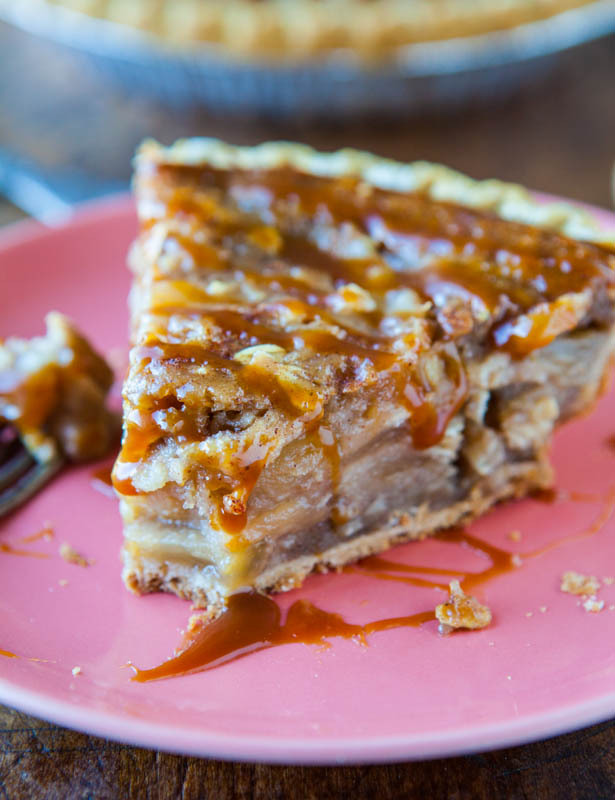 Favorite apple recipes? I have only made the recipe as written and the only way to know if something will work when baking is to try it out. Good luck! Thank you for this awesome recipe! Tasted yum, wouldn’t change a thing. Thanks for the 5 star review and glad you wouldn’t change a thing! Thanks for the 5 star review and glad this is a lunchbox hit! I sibbed out the banana with applesauce and it worked just as well! Super soft and delicious! My baby is going crazy for them! Thanks for the five star review and I’m glad your baby loves them! These were very easy to make and absolutely delicious! 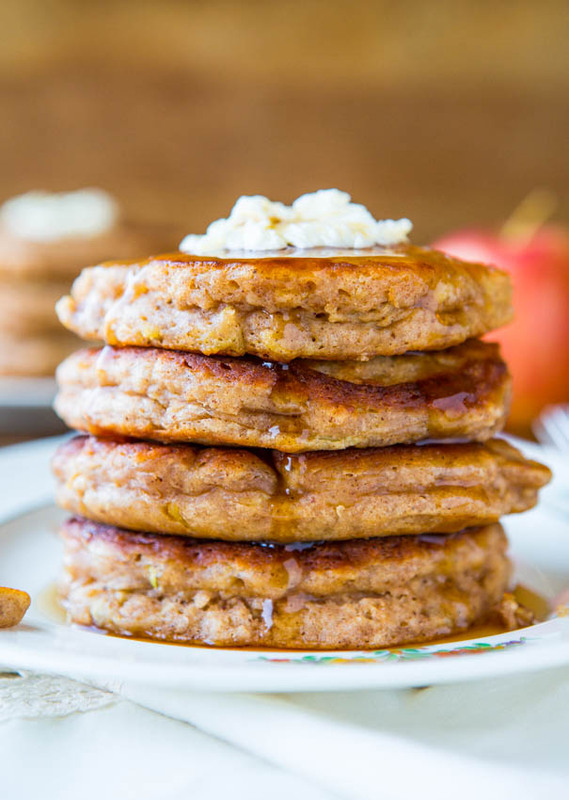 I didn’t have bananas on hand so I subbed 1/2 cup of pumpkin puree and they are perfect for fall! Also I used vegetable spread instead of coconut oil to make it less greasy, lower calorie, and to prevent that unfortunate solidification while I’m trying to mix up everything! 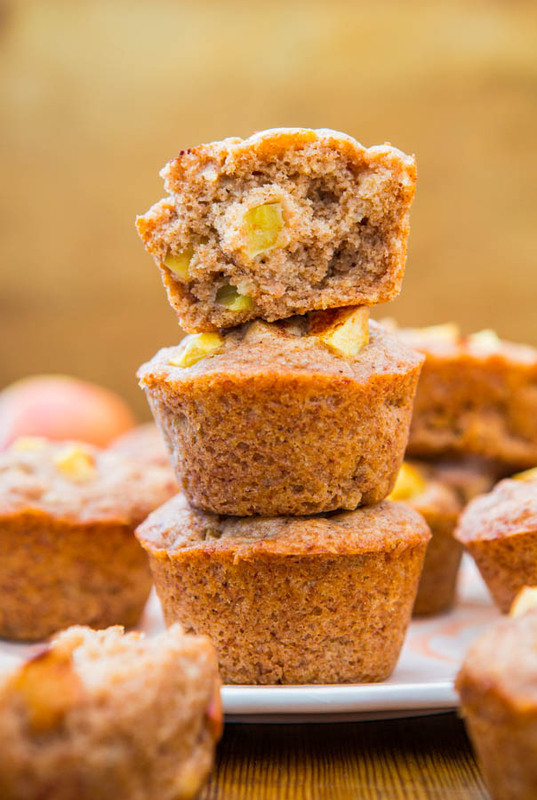 They make great muffins and you’ll probably want to double the recipe otherwise you’ll eat them up before you know what happened! 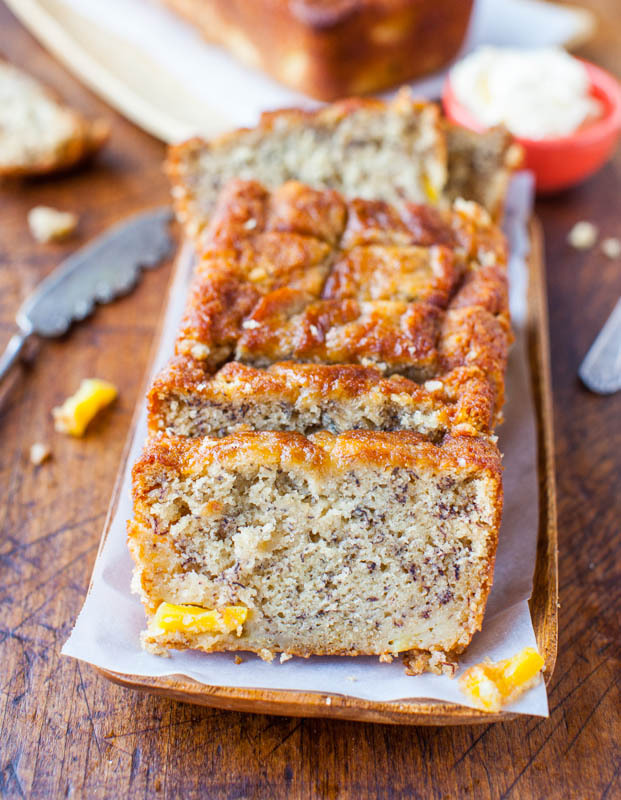 Last time I tried doubling and used the other half to make a loaf of bread instead and it was heavenly! 10/10 would recommend this recipe to Anyone! Thanks for saying that these are a 10 out of 10 for you! Glad that you were able to make bread from the recipe as well! Hi Avery! Thanks so much for this delicious recipe. I have the triple-challenge in baking in my kitchen: high altitude (5000+ ft), celiac disease (so everything gluten-free) and now we have chosen to go with a primarily plant based diet. I made this quickly this morning using less baking powder for the altitude (1-1/2 tsp), and GF flour for the all-purpose flour. Unfortunately, I was in a hurry and forgot my go-to baking trick for GF baking and they turned out gummy in the center… totally my fault. But even so, THEY TASTED AMAZING and no one is complaining about the texture. Next time I will use 3/4 cup GF flour and 1/4 cup almond meal (that’s my trick that has so far worked every time for changing a non-GF baking recipe successfully). I will try them again next weekend with that adjustment and let you know how it goes (for any other vegan celiacs 🙂). Thanks again! Thanks for the 5 star review and glad this recipe fits the bill for you and yes you do have a triple baking challenge going on but glad these work for you. Thanks for sharing what you did, I’m sure others reading it will find it helpful. They are in the oven, the batter was very very thin. I am kinda worried these will never firm up. The batter tastes amazing though! These are AMAZING! Thanks for a wonderful recipe! Thanks for the five star review and I’m glad they turned out amazing! I made these muffins and they turned out quite well! I added 1/2 cup of rolled oats to mine because of concerns for thin batter, and I used applesauce (no bananas on hand). Admittedly, I forgot to coat the apples with flour, but they were still well distributed. Thank you for the recipe, it’s excellent!Just a note, I calculated the calories per muffin (assuming one makes 12 total muffins) and I got about 160 calories apiece (175 with oats), which is much lower than the calculated value from the Nutrition Information button. Did I miscalculate something? Thanks for the five star review and I’m glad you loved the muffins! The nutrition stats listed are a computer generated program and not always perfect.